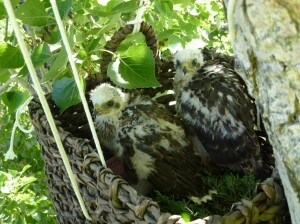 Baby Cooper’s Hawks Return to the Wild /Hawks Aloft Inc.
We thank PNM, who generously provided their professional tree-climbing crew to put a makeshift nest high in a tree for baby Cooper’s Hawks. The original nest and five nestlings were blown out of a tree in Rio Rancho during last Sunday’s high winds and dust storm. “Dusk was coming, dust was everywhere and the wind was blowing hard. No one was out in the nasty weather but me and the PNM linemen,” said rescuer Lisa Morgan, Raptor Rescue Coordinator. Unfortunately, only two of the birds survived the fall. Today those two were returned to the area where their parents were last seen. Tree climbing crews from PNM’s vegetation management department helped secure the new man-made nest high in a Cottonwood tree and delivered them to their new home. While crews were working to renest the chicks, the father returned to the area to watch over his nestlings. Cooper’s Hawks may “dive-bomb” pedestrians who come close to their nests. This activity will subside within the next few weeks. People should wear hats, carry umbrellas and avoid areas where Cooper’s Hawks are nesting.